Resumes can set the tone for your future career. 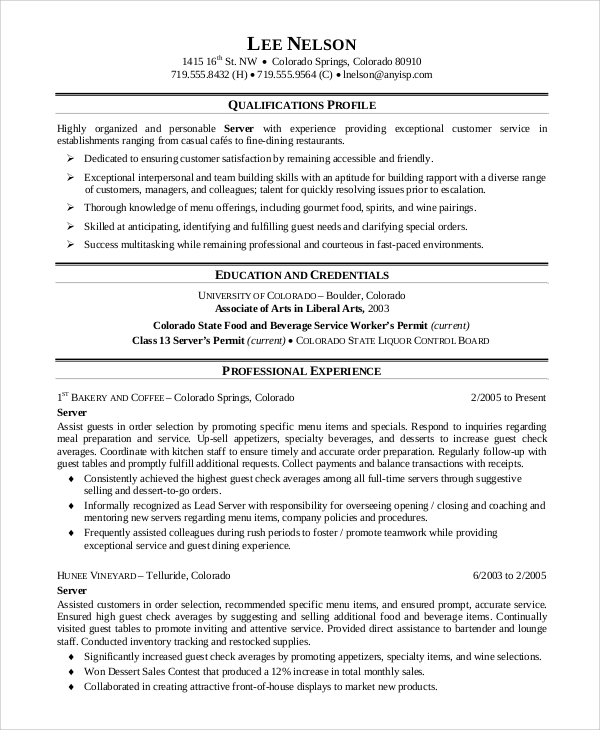 A better resume can fetch you a better job. Sample Resumes create the first impression, and if they are professional and clean, the interviewer is likely to favor you over others. For server jobs, the resume is the most important thing that an employer will look and will hire you based on that. In server jobs, there are least technical skills and more about the experience and how you list your stuff in the resume and present them, will make the difference. 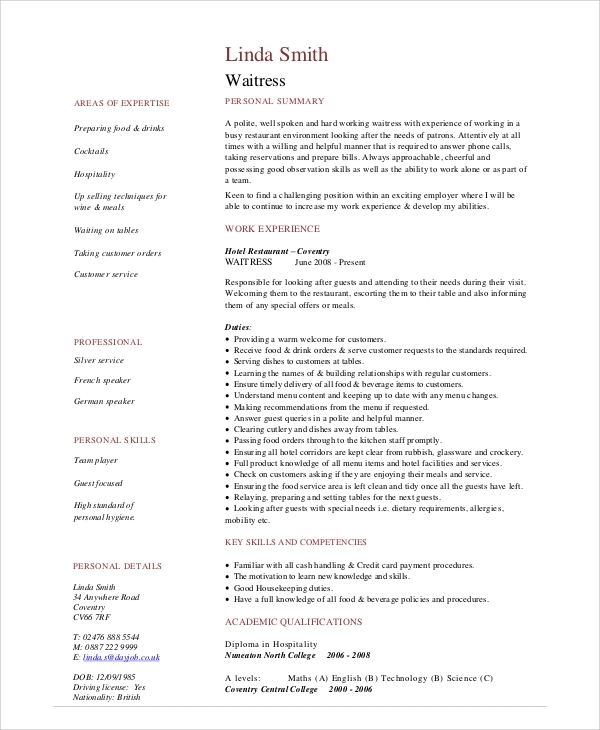 This is a creative restaurant server resume containing areas of expertise and personal traits with professional skills. It lists the duties performed in the previous jobs and provides a thorough personal summary. This is an incredible resume for applying for server job as host or hostess, waiter, bartender and food worker. It has a beautiful layout, and it contains a professional summary, objective statement, past employment details, main contribution under previous employers, and so on. It has multiple resume samples for different types of server jobs. 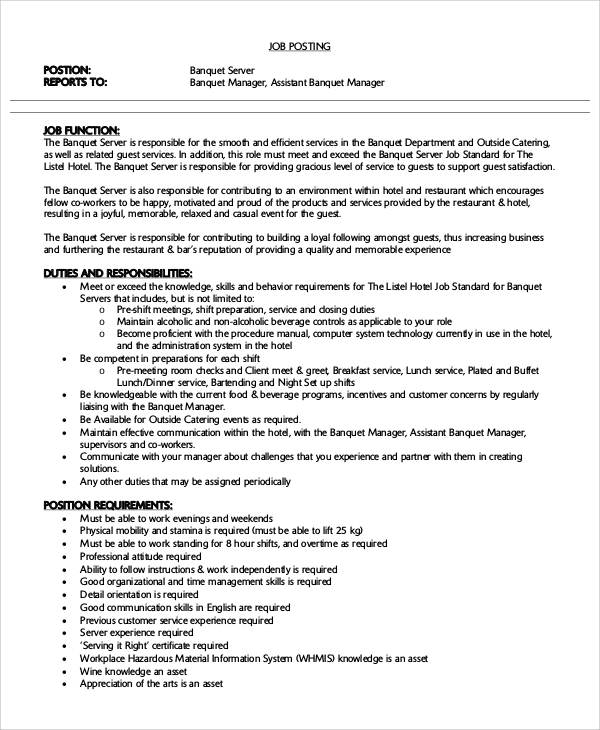 This is another awesome server job description resume containing a creative layout. It lists the areas of expertise, professional and personal skills. It describes work experiences and contributions in the past, personal summary and competencies. This is a perfect resume for food servers. 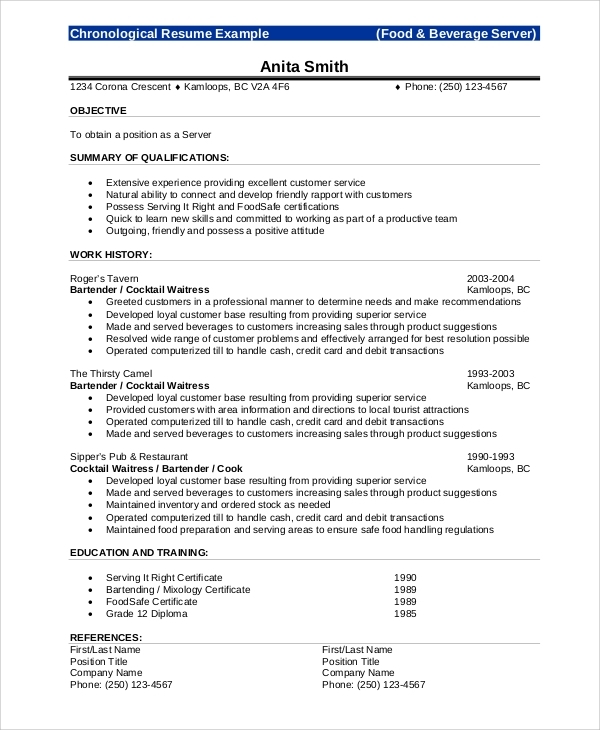 This is a manual which states how to make a great resume and then specifically focuses on preparing a food server resume. It also states what functional, chronological and combination your resume should contain and it also provides a checklist. 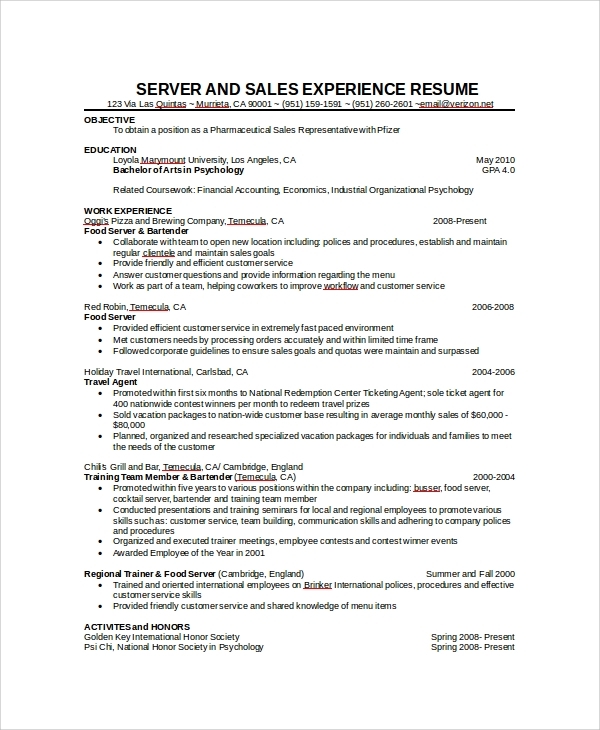 This is a banquet server resume sample with a nice structure. It contains a professional resume, lists the personal traits relevant for the job, professional skills, past work experience in a chronological order. 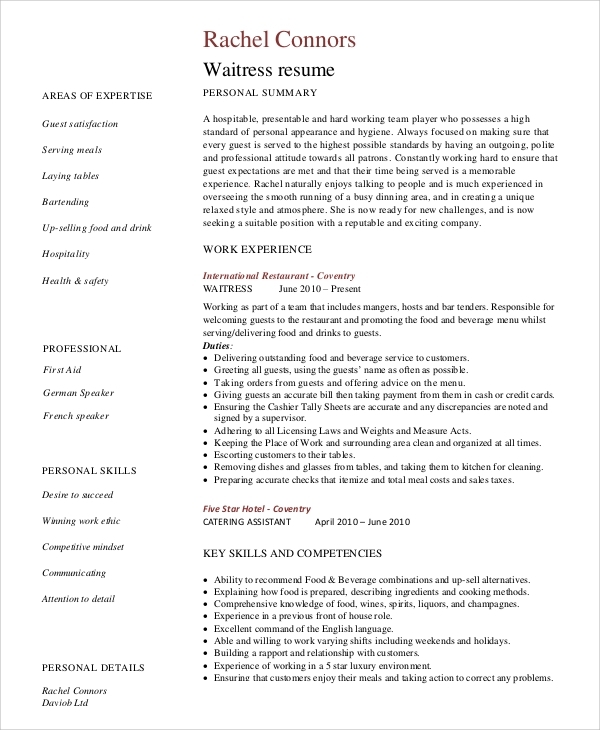 Resumes are the most important part of getting a job when it comes to jobs related to serving such as a waiter, waitress, food servers when least number of technical skills is required. It is the resume that a candidate provides while applying for the job that creates the first and last impression. The above-mentioned samples, manuals, and formats will help you to design the most impressive resume that will increase your chances of getting the job easily. They have different creative formats for the various categories of server jobs. 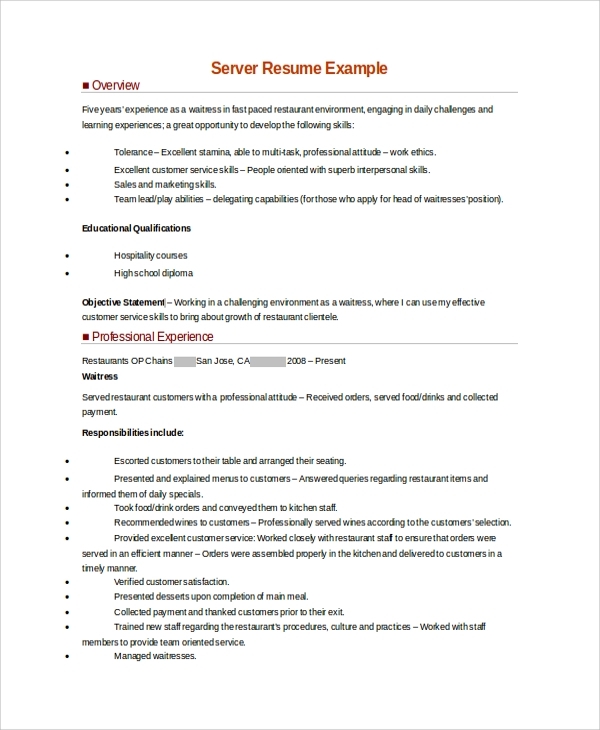 The targeted audiences for the server resume templates are all those freshers who want to become a food server, waiter, waitress, host, hostess, banquet server and such server related jobs. Even it is highly useful for the experienced server to apply in better places and get better positions and salaries. They have different templates for all of them according to their needs, and all the required skills and traits are already mentioned. One can either copy them or edit them to prepare their strong resume. You may also see the Sample Waitress Resumes. The above-listed server resumes are perfect and tailor-made to get you the job you want. They have the perfect formats that will make you shine over others, and they have multiple resumes on different types of server jobs like waiter, waitress, host, hostess, food server, banquet server and much more.